Make a splash. Bring your border to colorful life. Can-you-believe-your-eyes blooms are purple petals enthusiastically splashed with white. Sturdy plants bloom in early summer—produce vase upon gorgeous vase of cut flowers. Sow in average garden soil in a sunny area after danger of heavy frost. In the deep South, Gulf and Pacific Coast areas, sow from fall to early spring. Prepare the bed by turning the soil under to a depth of 6-8, inches removing any debris, and lightly raking as level as possible. Sow in rows 15-18 inches apart. Sow seeds evenly and cover with 1/4 inches of fine soil. Thin to at least 18 inches apart when seedlings have three sets of leaves. Up to 36 inches for tall varieties. Mulches also help retain soil moisture and maintain even soil temperatures. For annuals, an organic mulch of aged bark or shredded leaves lends a natural look to the bed and will improve the soil as it breaks down in time. Always keep mulches off a plant’s stems to prevent possible rot. Use low rates of a slow release fertilizer, as higher rates may encourage root rots. Plants need good air circulation to avoid powdery mildew. Asters are sensitive to the length of the day. They will not bloom until late summer but should bloom until frost. Annual asters, also called China Asters, make great cut flowers. Cut when blooms are 2/3 open. 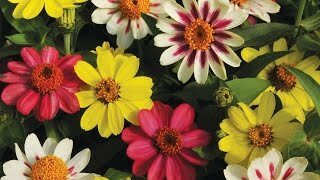 Use in beds and borders, they work in containers too, although keep in mind they will not bloom until late in the season.